He knew they were tired. The disciples had just returned from the first ever mission trip. But Jesus could not turn away from the crowd which gathered, which appeared lost and desparately seeking some source of sustenance, of authority, of nurturing. And seeing their need, their seeking and their asking, he had compassion, he was moved in his guts with empathy, he could not turn away. It was almost too much, these apostles whom he sent out to proclaim the good word, to heal and to serve, to be caretakers, they were tired, and yet when he sees this crowd, he responds immediately. He turns to them, cares for them, teaches them. And when they get hungry and his disciples, who, let’s face it were tired and hungry themselves (oh how they their hearts must have leapt when he first suggested they move off to a lonely place, to rest and rejuvenate! ), tired as they were, they must serve and heal, and care for others again. Right now. Urgently, respond. They must have been so deflated. Imagine that moment when you have worked hard all day, meeting people’s needs, helping them, hearing them out and you know they are going to be getting hungry very soon and you say to your boss. “Let’s call it a day, before they get hungry and cranky and irritable. Let’s send them away so they can feed themselves.” And your boss, your teacher, the one you admire so much says, “You feed them.” Wow. It’s not as if you haven’t worked hard all day, and now he asks the impossible. Yet, the disciples know too what it is to be lost, to be frightened and to be desparate. Alone on the sea, after feeding this huge crowd, they too cried out, and again Jesus , moved with compassion, responded. Our text tells us that he “intended to pass on by” but hearing them, seeing their lostness, their fear, their seeking and their crying out, he could not refuse them. Our text also says, they did not understand because their hearts were hard. What is it about our human nature that helps us to see our need while failing to see the needs of others? It’s a very human thing to do. Our Ephesians text deals with just this type of hardness; that of self selecting our own kin, of seeing the needs of those like us and for us. Last week as I wandered through the streets of New Orleans I wondered what Jesus would see differently than I did. It might have gone something like this: As Jesus walked through the city of New Orleans there were many people of many different tribes. They were tattooed and wore little clothing. Some slept outside in the parks and washed themselves in the fountains. They were brown and white, some with close cropped hair, others with long dreds hanging down their back, still others wore their hair braided or in long luscious locks, each according to the custom of their people. Jesus walked among them without regard to these divisions, speaking, healing and teaching as the need directed him. If his disciples had been there they might have wondered, why would he speak to such as these? Yet when they themselves were lost and scared, they would cry out, and Jesus would answer them, assuring them that all is well, God is still in charge, and things will turn out OK. If you have traveled much you know the need of keeping one’s eyes away from other eyes, especially those belonging to people holding cardboard signs. Just as, if you have lived in a touristy area, you learn to spot the tourist quickly and avoid any unnecessary entanglements. We learn early to protect ourselves and our resources. But…Jesus calls us to another way of being. See one another, he asks, feed one another, he commands, care for one another. This last week I visited a place called Café Reconcile. It is in what used to be called the murder capital of the US, according to a member of their board. On the corner where the Café is located an old pay phone used to hang. It was the phone drug dealers and pimps would use to conduct their business. But not today. Today it is a place of hope, a place of promising futures, of health and wholeness, of new beginnings. Walking up the roads to Café Reconcile is a bit of a stretch for an upper middle class white woman. I walked past lovely houses which were in horrible states of disrepair. One of them bore a grafitti stating , “No one cared,” not so much grafitti as a cry for help, a cry for caring. As my daughter and I walked by it brought up instant reflections on the Matthew’s farmhouse where we live. We care. And it is only because we care and John cares, and other family cares, that the farmhouse is still standing. Because we care. And in the middle of this poor neighborhood, a black neighborhood which borders on the wealthier white neighborhood, the grafitti calls out, “Will no one care?” And this touches my daughter and I especially because we care, we care that the Matthew’s farm and cemetary be saved. We care that this old historical house, with all its history, be saved. And so we walk by this grafitti on this gracious old house, with its windos knocked out and the walls rotting, with our hearts on our sleeves, talking to one another about how one person, with a power drill and some determination, might care. We walk by another house, large enough to house at least two generations if not three, but it’s roof had collapsed against the brick and plaster front wall. Does no one care if this family is left on the street? But one walks on, avoiding eye contact with the black men in lawn chairs seated in the shade on the corner. Because it’s scary and it’s different and to be honest, I’m the circumcised, circumspect, grade a approved american citizen and they are not, and I feel this difference in every wondering stare that greets me as I walk down these streets. Do I need to say more? In a country where the risk of being killed is 18 times greater if one is black than white? (Feed them, Jesus says, but I, scared and frightened, walk by, avoiding eye contact). But then, woohoo! We made it to Café Reconcile. Which today feels like the domain of white people trying to do good in a black neighborhood! Safe! At least, it feels that way. 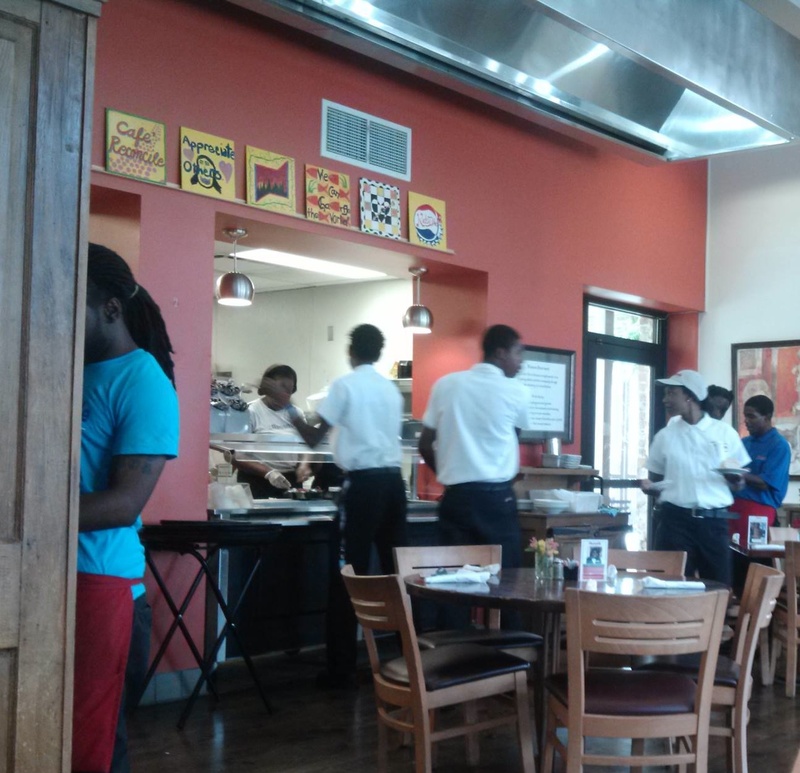 Here black youth hold open the door and greet me eagerly, guide me to a table and serve me a delicious meal. OK, let me be honest. I know these are youth, scared and excited and hopeful; hopeful that they too might share in the economic safety and growth that I was born to, but I want to know them. And I want to feel good about this, because I know that the huge tourist industry, which crowds the streets of the french quarter, and which pays for lap dances on Bourbon street, or cheap Mardi Gras masks at every other venue, won’t venture down into this neighborhood, so I want to pat myself on the back….but I can’t. I can’t because, even as I see these wonderful, incredible young people, who are just beginning to seek out a better future, I know I am one of those people who would avoid eye contact with any of them if I met them on the street. I know that I am one of those people who would be scared if a group of them approached me on the street. Like the Ephesians, I am scared of people who are different, and like the disciples, I cannot believe that Jesus would ask me to feed this crowd…but, that’s what he asks me to do. It’s what he asks you to do. Sitting at the table, in the Café with the board member, I hear her say, “Some people think that coming here and eating a meal is a fair way to support our work but it isn’t. It doesn’t begin to cover our costs. It does not excuse us from seeking the safety of a white place with white rules where brown and black youth serve us with the hope that they might be cared for, that they too, might matter. It is so easy, for me, for others to simply see these smiling young faces and feel as if we have done enough, but if we allow that to be enough, then we have failed to follow Christ, we have failed to join him in the response to such grave need. “For he intended to pass them by’ and perhaps seek some well deserved time off and perhaps take a breathe, just one breathe that wasn’t dedicated to serving someone else, but he heard their cries and out of deep need he responded; out of deep need and deep caring, he responded. He had compassion and so should we. Do we feel God responding to our need? When we cry out, and we are frightened, and we are scared, do we feel the rising of the spirit in God’s community? And are we willing to be that response? Are we willing to be that response to those who do not look like us? Who are not the “appropriate” people to care about? Are we willing to be the answer to those who cry out, “No One Cared”? are we brave enough to care? A couple years ago a wonderful ministry was begun in Bend Oregon to feed the homeless people. It was called Common Table and the theology that began it was one that said justice is not the receiving of scraps from the table, but an invitation to the table, and as such everyone, regardless of their ability to pay, was invited to share the same meal at the same table. When I visited I would sometimes pass homeless youth on the streets begging for money, hoping to spend a night in a hotel instead of outside in the cold, in temperatures cold enough to kill, but then, moments later, I would be sharing a sumptous meal with them at Common Table. It isn’t really enough, but it’s something. White people, doing good, in a black neighborhood, those who have sitting side by side with those who don’t have, and sometimes, yes, trying to absolve themselves of some guilt in the process, but still, trying to do some good. We see the writing on the wall, does anyone care? And we must respond, no matter how tired we are, that we care, that we will give of what we have, and yes, we really, really, care. Even when it’s outside of our safety zone, we care. We will not be reconciled to those who our society disregards simply with a meal or a smile, a simple hello or how do? We will be reconciled with the disempowered and disenfranchised, the disregarded when we participate in their struggle to be seen, to have a voice, to make possible a brighter future. There is no simple solution but there is a call to participate, to identify those systems which continue to oppress others and to help break through these systems to a better way of being. Jesus did not tell his disciples, “Well, tell them you’re sorry they have nothing to eat and tell them you’ll pray for them. Wish them well and then let’s move on.” No, he said, “You feed them.” And so we stand challenged to pull together what resources we have, even if they seem too small, and set about feeding God’s beloved people. Does anyone care? We do. We do because God cares for us, because God has changed our lives, because God asks us to care. We do. We care. Go forth and love my people, Jesus said, go and love them and heal them, bring them a word of grace and love, feed them. And so we shall, even if all we have is five loaves and two fish.